Scampi can refer to two different things. First of all scampi is a culinary name for a kind of small lobster Nephrops norvegicus, known as Norway lobster, Dublin Bay prawn or langoustine. This is true scampi. 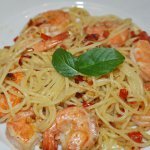 But in the USA scampi is also used to describe the style of preparation of any shrimp. In other words, term shrimp scampi could mean “shrimp shrimp” or “scampi scampi”! We're not going to change anything, that is why we suggest you cooking shrimp scampi to celebrate today's holiday. Heat a pan on a medium heat and swirl in some butter and olive oil. After the butter melts, add a little salt, stir in the slivered garlic and red pepper flakes. Sauté garlic for a minute, then add the shrimps and white wine. Stir shrimps to cover with the sauce and cook for 2-3 minutes on a high heat. Remove the pan from the heat and sprinkle shrimps with parsley and lemon juice, add black pepper and toss to combine. Serve shrimps over pasta or rice. Happy National Shrimp Scampi Day!